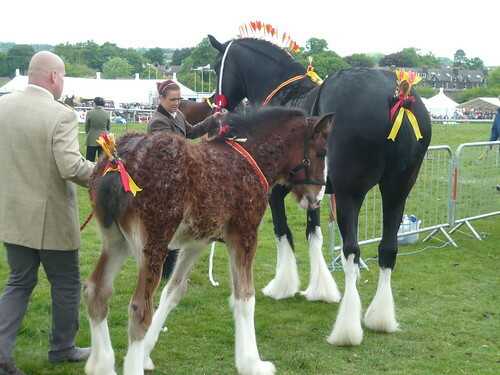 The Shire Horse is held to be the tallest of the modern draught breeds and can be black, brown, bay or grey in colouring. Its distinctive feature is long, silky hair, commonly white, on the lower part of its legs. The title “English Cart Horse” was adopted in 1878 but changed to “Shire” some years later. They are ideal for pulling vehicles and are still used for beer and bread deliveries, street cleaning and rubbish collection. There are attempts to re-introduce Shire horse-power on canals both for commerce and leisure. Shire horses continue to be used in agriculture and timber operations to complement mechanisation. Largest individual British Heavy Horse may well be Digger the Clydesdale who is still a youngster and has some growing to do. Digger is set to enter the record books as Britain’s biggest horse as in 2007 he measured 19 hands (6ft 5in) or 9ft when his head is up. The world’s biggest horse is alleged to be Sampson, foaled in 1846 in Bedfordshire, England, stood 21.2½ hands high 7ft 2½in at his withers, and weighed approx 3,300 lb or over 1.5 tonnes. Other varieties of draft or cart horses found in Yorkshire include, Cream Draft, Percheron, Boulonnais, Belgian, Clydesdale, Suffolk, Brabant, Shire and Ardennes. Clydesdales, and other members of the breed are used as drum horses by the British Household Cavalry. 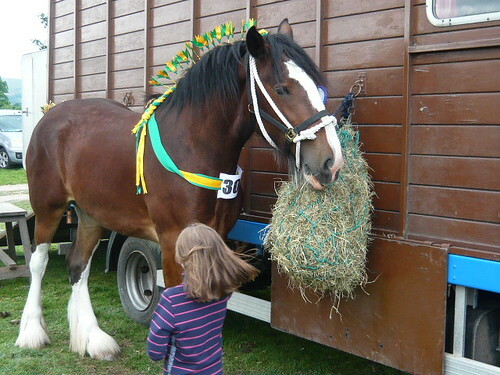 Local shows at Epworth and Otley in May and Eastrington and Todmorden in June and Harthill near Sheffield are Yorkshire venues where these horses can be seen on parade. Staintondale Shire Horse farm is a visitor attraction celebrating its 25th anniversary in 2010. it is located between Whitby and Claughton near Scarborough.